Acel Moore wasn't planning to die during Black History Month, but at services Monday for the legendary Philadelphia Inquirer journalist, whose death came Feb. 12 at age 75, the black history he personified couldn't help but be part of the program. "The headlines of Acel Moore's impressive career in journalism are well known," Eugene Roberts, executive editor of the Inquirer from 1972 to 1990, told a sober throng of 400 that filled Philadelphia's Grace Baptist Church. "From copy boy to member of its editorial board of the Philadelphia Inquirer. A founder of the National Association of Black Journalists. "The first black journalist to win the Pulitzer Prize for reporting and writing. . . . He was a key figure in steering the Inquirer from a segregated news room to one of diversity . 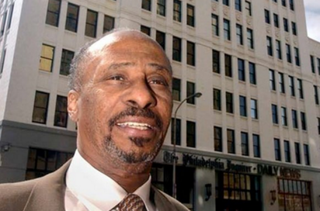 . . And he was deeply involved in a program to bring minority copy editors onto the Inquirer in the 1970s when there were none in the business to recruit. . . ."
Moore was the first black reporter at the Inquirer, working his way up from copy boy in 1968. In addition to co-founding NABJ in 1975, he had co-founded the Philadelphia Association of Black Journalists two years earlier. A sizable contingent from both groups was present, but this funeral, unlike those of many journalists, was populated by as many community people as journalism colleagues. Ken Jackson was one of the community folks. He knew Moore because Jackson is a trustee at Grace Baptist Church, where the Moore family worships, but also because Moore had written a story about Jackson's brother, Robert Jackson. An inmate, Jackson was killed in 1966 when authorities performed medical experiments on prisoners, his brother said. In 1977, Moore and Wendell Rawls Jr. won the Pulitzer Prize for local investigative reporting for their series on abuse of inmates at the Farview (Pa.) State Hospital for the mentally ill. Nor was history far away when the Rev. Isaac J. Miller, retired pastor of the Church of the Advocate, eulogized that Moore "had the ability to say and write eloquently that we are all made in the image of God" despite the bigots and racists among us, and considered his job "to tell the stories of those whose humanity was discounted." About 400 mourners filled Grace Baptist Church for the Acel Moore service Monday in the Germantown section of Philadelphia. "Elmer Smith, a retired black columnist at the Philadelphia Daily News, recalled that the church has an activist history: It hosted a the Black Power Convention in 1968, complete with armed men standing guard outside. "Acel was always down with anybody who was doing something," Smith told Journal-isms. "He was my mentor. Everything he had done before me he had done [and done] well. I saw myself in Acel. Moore's career at the Inquirer was itself a product of history's currents. "I was hired by The Inquirer because a group of ministers, led by Rev. Leon Sullivan and other black community leaders, organized a very successful boycott against businesses in the city that had discriminated against blacks," Moore wrote in 1981. But first he had to rise from copy boy to reporter, a journey of six years that Moore considered an apprenticeship. "I view the six years I spent working as an editorial clerk as a unique apprenticeship, one that I wouldn’t change if I had it to do over again," Moore continued. "I saw how racism and the exclusion of blacks from both employment and news coverage by The Inquirer and other news agencies impacted on the events daily. "I saw how blacks were only featured in crime stories, how stories about the masses of blacks were ignored. Only the extreme elements of the black community were news. "Blacks never died, never married, never did the normal things that whites did. . . ."
Also at Monday's service was Bill Bryant, whose Inquirer career paralleled Moore's, but on the business side. In 1968, Bryant became the first black single-copy sales supervisor, the same year Moore became a reporter. They first met at police headquarters. Bryant, 78, said he thought the gathering was "terrific. I got to meet some people I didn't think I'd ever see again." Bryant remained at the Inquirer for 36 years; Moore was there for 43. In his tribute from the pulpit, Joe Davidson, a columnist at the Washington Post and fellow co-founder of NABJ who first met Moore in 1974, praised Moore's role as co-producer of the pioneering black public affairs show "Black Perspective in the News," which debuted on WHYY-TV in 1968. "It only lasted for a few years," but it was "an example of institution building, and I was proud to be on the panel," Davidson said. But pioneering as that show was, another mourner, who preferred not to be identified, went back further. "New Move, New Breed" preceded "Black Perspective on the News" and a group called Black Communicators preceded the Philadelphia Association of Black Journalists. Such was the era in which Moore came of age. The powerful sent tributes. The Pennsylvania House of Representatives, former Gov. Edward D. Rendell and the Philadelphia District Attorney's Office were among them. Rep. Chaka Fattah Jr., D-Pa., and State Rep. Dwight Evans, D-Philadelphia, were in attendance. The U.S. Department of Veterans Affairs designated Moore "veteran of the day." In 2012, Moore donated his personal papers to the Charles L. Blockson Afro-American Collection at Temple University. They include his columns, correspondence, photos, columns, printed material, books and information about NABJ, Aslaku Berhanu, the collection's librarian, told Journal-isms on Tuesday. She said they would be processed and made available to the public "as soon as possible." Still, it was the Philadelphia native's interactions with his community and championing of their interests that were central to his role in black history. "Walking down the streets of Philadelphia with Acel meant you were literally walking for hours because so many people would stop to say hello or he would stop to talk to people," Murray Dubin, a former Inquirer colleague, told Lauren Mayk of Philadelphia's WCAU-TV. Roberts told the mourners that Moore's efforts to recruit copy editors of color were successful. "The secret? Scouting colleges for students who were strong on grammar, urging black English teachers to take the paper's copy editor exam. Alexis Moore, who was one of them, is here today." Roberts also said, "But of all his many contributions, it was Acel's openness, his welcoming smile, his willingness to take hours and days to introduce a new staff member to his beloved Philadelphia, that will live longest in the minds of many veteran Inquirer staff members. This was no small contribution at a time when the Inquirer was recruiting journalists from across the nation, most of them with A-plus ability but with little knowledge of their new city. "No one in in the newsroom had an easier manner than Acel, no one knew the city better, and no one was more willing to help. "So thank you, Acel. You left your mark on your newspaper and your city and in our memories. Again and again and again." From the pulpit, Gerald T. Davis, a retired Sunoco executive and friend who spoke with Moore just a couple of hours before he died, agreed. "Acel gave and gave and gave," Davis said.